When the Russian foreign minister, Sergei Lavrov, said that “all foreign troops must leave Syria,” an editorial in an Iranian newspaper fired back saying that “according to Moscow, all foreign troops must leave Syria, except Russian forces.” For some time now, the Russian and Iranian media have been trading jabs, indicating that the gap between the two allies is widening over Syria, a fact that can give Syrian President Bashar Al Assad some leeway to maneuver out of the control of both, but might also force him to choose sides, something that he has been trying to avoid. Other than preventing Assad’s downfall, Moscow and Tehran agree on little else. The two have different world views. Throughout much of the past century, Russia was the world’s other superpower, and enjoyed perks in the international order that it helped create after World War II, such as Moscow’s veto power at the UN Security Council. However, since the downfall of the Soviet Union, Russian strength has waned substantially. Its economy has declined from the second biggest in the world to 11th place. Russia’s population has been shrinking, while its universities have fallen behind in the number of annual patents and citations in journals. Russia has remained a nuclear power with considerable military muscle, but its military is nowhere near as formidable that of the US. The US, for example, has 11 state-of-the-art aircraft carriers. Russia has one, the Kuzentsov, which spends more time in the repair docks than at sea. But Russian President Vladimir Putin thinks that he can make up for his country’s economic and military weaknesses with his wits and through propaganda. As part of plans to outmaneuver the West to retain Russia’s status as the world’s other superpower, Putin has engaged in small battles through which he thinks he can either fan out his feathers, as in his military intervention in Georgia and Ukraine, or make gains, such as with Syria and Iran, with which he can win Western concessions. Unlike Russia, the Iranian Islamic republic was created in 1979 on the premise that the international order was built in such a biased manner that it robbed the great Iranian civilization of its international leading position. And so, unlike Russia, which has stakes in preserving the world order and shaping it to its benefit, Iran is out to construct an alternative order, one that gives Tehran a bigger role. Judging by speeches of Iran’s Supreme Leader, Ali Khaminei, in which he calls for the creation of an “economy of resistance,” Tehran believes that – together with its allies Iraq, Syria and in Lebanon and Yemen – it can create a “Greater Persian Gulf,” to put it in the words of its foreign minister, Jawad Zarif. Iran became involved first with military advisors, then battalions of Shia militias from around the region: Hezbollah from Lebanon, a few militias from Iraq and Shia fighters from Afghanistan. Yet, despite its best efforts, Iran could not holdback Al Assad’s opponents, and hence went to Moscow begging for support. Together, Russia and Iran did manage to keep Al Assad’s head above water, and even helped him regain control of over half to two-thirds of the country. But although they direct their firepower in the same direction, this didn’t mean Russia and Iran had similar goals. There were battles in which Russia refused to provide air cover, resulting in mass casualties among pro-Iranian militias. Putin wants all pro-Iranian militias out of Syria. He has proclaimed “mission accomplished,” and now thinks it is time for Moscow to consolidate its gains through a three-dimensional political process that includes local, regional and international players. Putin also probably hopes to win international recognition for his control of Ukrainian Crimea, perhaps in return for some concessions in Syria, including deposing Assad. Iran sees things differently. Its war in Syria is part of a long-term effort to create and maintain the “resistance axis.” It wants to replicate Hezbollah in Syria, with an advanced military infrastructure with which it can threaten Israel, and therefore blackmail Western capitals. If Moscow and Tehran keep pushing in different directions, Al Assad would be forced to choose between them. If he chooses Iran, he will keep Shia fighters who have been instrumental in guaranteeing his survival, albeit under Iranian control. But he will lose Russia’s veto power at the UN, alongside Moscow’s supply of military hardware. If Al Assad chooses Russia, he will keep Moscow’s protection at the UN, but might be unable to stand on his own, since his military manpower has been almost decimated. As it stands, the current status quo might be Al Assad’s best bet, perhaps until something changes in the future. 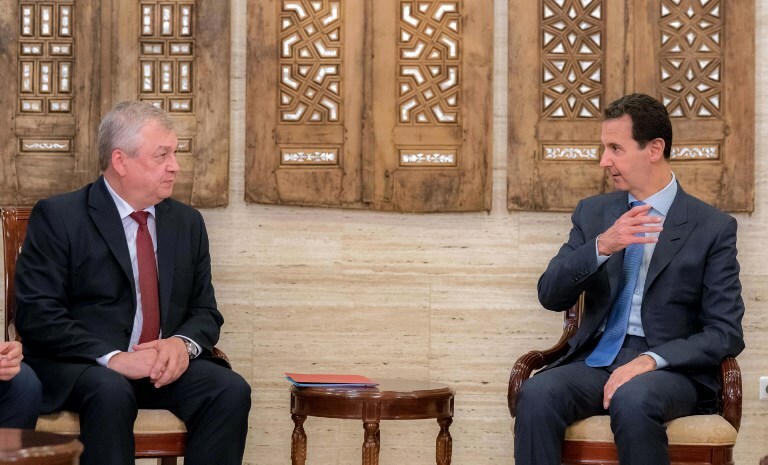 However, should any of his sponsors start pursuing their opposite agendas – a Russian settlement versus an Iranian military victory – then Al Assad will certainly find himself in a precarious position. Hussain Abdul-Hussain is the Washington bureau chief of Kuwaiti daily Al-Rai and a former visiting fellow at Chatham House in London.